If you are looking for an extremely reliable, water resistant, crushproof, and dust proof container, we have done the work and found several sizes for you. It's time you gave your geocache protection from Pelican. The manufacturer has over-engineered these clear-lidded cache containers, knowing how we like to play outside and knowing how unpredictable nature can be. 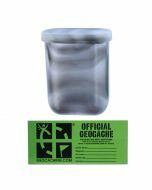 Text and Geocaching.com URL are integrated into the lid and permanently identify the purpose of this box. Cache lid is clear for safety. Easy-open latch; rubber liner for extra protection doubles as o-ring seal. (The liner can be removed to make the case see-through from all sides, but then you wouldn't have the o-ring seal. ); automatic pressure equalization valve - balances interior pressure, keeps water out; stainless steel hardware; lanyard. Pelican's legendary unconditional lifetime guarantee: "You break it, we replace it...forever." These heavy duty polycarbonate watertight cache containers are strong and feature simple ABS latches, corrosion proof stainless steel hardware, and have an automatic purge valve. Exterior dimensions: 9.37" x 5.56" x 2.62"
Interior dimensions: 8.25" x 4.25" x 2.25"